But Spring framework just didn't stop there, it also provides useful API to Java programmers. The best thing is that Spring has been kept evolving since its inception and addressing Java developers concern in different areas. Spring framework is divided into many different modules like Spring MVC, Spring Integration, Spring Batch, Spring LDAP, Spring Security, Spring Boot, Spring Clod and several other modules, which focus on a particular area. For example, Spring Boot tries to make it even easier to use Spring framework by reducing the amount of configuration you need to put in for Spring itself. Spring Cloud is evolving to become the best framework for developing cloud-based Java frameworks and Microservices, which is need of future, and Spring Security has established itself as the go-to framework for security Java web applications. Based on your work experience, Interviewer can ask questions from core Spring or these modules. That's why, while preparing the Spring interview question focus on Spring core, Spring Security, and Spring API, these are main areas from where interviewer ask questions. If you have working experience in Spring-based Java projects, you can easily answer most of these Spring questions from several Java interviews, but if you don't have any prior experience and just learning Spring, I suggest you to go through Spring Framework 5: Beginner to Guru course on Udemy to learn Spring fundamentals before attempting these questions. Very common Spring interview question, Spring is a framework which helps Java programmer in development. Spring provides Dependency Injection and IOC container, Spring MVC flow and several useful API for Java programmer. The default scope of a Spring bean is the Singleton scope and in the web application default scope of a spring bean is request scope. Singleton bean means the same instance of a bean is shared with all other beans, while request scope means a bean is alive only for a request. 3) Does Spring singleton beans are thread-safe? No, Spring singleton beans are not thread-safe. Singleton doesn't mean bean would be thread-safe. Dependency Injection is one of the design pattern, which allows injecting dependency on Object, instead of object resolving the dependency. The simple meaning of inversion of the control means that now the framework, Spring is responsible for creating objects, wiring dependencies and managing their life-cycle instead of a developer, which was the case before. That's where control is inverted from developer to framework. Spring MVC is a framework to develop Java web application. It provides an implementation of MVC or Model View Controller architecture which is built on separation of concerns and makes the development of Java web application easy. In order to use this in your project, you need to learn Spring and include its JAR file. 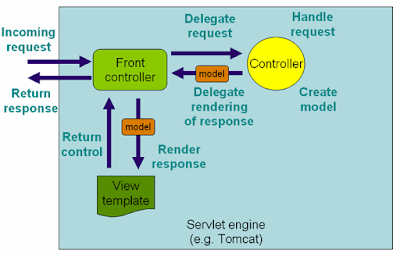 Spring MVC framework also supplies inbuilt view resolver for selecting views. See Spring Master Class - Beginner to Expert to learn more about how Spring MVC internally works. View Resolver pattern is a J2EE pattern which allows a web application to dynamically choose it's view technology e.g. HTML, JSP, Tapestry, JSF, XSLT or any other view technology. In this pattern, View resolver holds mapping of different views, controller return name of the view, which is then passed to View Resolver for selecting an appropriate view. A controller is nothing but a class, also known as a bean in Spring terminology. If you are using annotation then you can create controller by using @Controller annotation. For RESTful web service you can also create REST controllers by using the @RestController annotation and in that case, you don't need to use the @ResponseBody annotation explicitly to tell Spring how it needs to respond. Btw, if you are interested in learning more about how to develop RESTful Web Service using Spring framework, I suggest taking a look at the REST with Spring course by Eugen Paraschiv of Baeldung. It's one of the comprehensive course which not only covers basics but also advanced concept like versioning, testing, and deploying REST API in production. 9) What types of dependency injection is supported by Spring Framework? When do you use Setter and Constructor Injection, pros and cons? There are 2 types of dependency injection supported by Spring, constructor based injection, and setter-based injection. Both types have their own advantages and disadvantages, you should use Constructor injection when an object's dependencies are not optional and they must be initialized with their dependencies. Also, use constructor injection if the order of initialization or dependency matters because in Setter based injection you cannot impose any order. Use setter injection when dependencies are optional. See the difference between setter vs constructor injection in Spring for a more detailed answer. 10) Can we use more than one configuration file for our Spring project? Yes, you can use as many as you want, all you need to is import them in the main Spring configuration file which you will load from your program. 11) What is Spring Security? Spring security is a project under the spring framework umbrella, which provides support for security requirements of enterprise Java projects. Spring Security formerly known as aegis security provides out of box support for creating login screen, Remember me cookie support, securing URL, authentication provider to authenticate the user from the database, LDAP and in memory, Concurrent Active Session management support and much more. In order to use Spring security in a Spring MVC based project, you need to include spring-security.jar and configure it in the application-Context-security.xml file, you can name it whatever you want, but make sure to supply this to ContextLoaderListener, which is responsible for creating Spring context and initializing dispatcher servlet. You can further see Learn Spring Security Certification Class learn more about authentication, authorization, and session control using Spring Security. They offer a standard way to use JDBC and JMS API, without writing the boiler code required to work with those API. You can use Spring Security to control a number of active session in Java web application. Spring security framework provides this feature out of the box and when enabled, a user can only have one active session at a time. 16) Explain Spring MVC flow with a simple example like starting from Container receives a request and forward to your Java application? I have explained to them from start to end in my article how does Spring MVC works internally article, you can check that for a detailed answer. 17) What is the difference in Spring MVC and Spring core? The Spring MVC is part of the Spring framework which helps you to develop Java web application using model web controller pattern, while Spring Core provides the Dependency injection and Inversion of Control. The Spring Container is part of Spring core. Both functionalities come in different JAR files. If you are developing just a core Java application using Spring then you just need Spring Core but if you are developing Web application then you need spring-mvc.jar as well. See Introduction to Spring MVC to learn more about Spring framework architecture and components. 18) If a user checked in CheckBox and got a validation error in other fields and then he unchecked the CheckBox, what would be selection status in command object in Spring MVC? How do you fix this issue? Since during HTTP post, if the checkbox is unchecked than HTTP does include a request parameter for checkbox, which means updated selection won't be picked up. you can use hidden form field, starting with _ to fix this in Spring MVC. quite a tricky question to answer if you are not aware of HTTP POST behavior and Spring MVC. 19) What are different implementations of the View interface you have used in Spring MVC? There are some methods in a Spring tag library, can't remember now. 21) Can you use Spring MVC framework along with Struts? I have an existing Java MVC application which is based in Struts, Can I migrate that to use Spring MVC? How? 22) What is the advantage of Spring MVC framework over Struts 1.0 or Struts 2.0 ? is it worth to convert an existing Struts application to Spring MVC? These were some of the Core Spring framework and MVC Interview questions from my collection, I have given short answers for most of these Spring interview question. I suggest to research more or read along those Spring question to prepare for follow-up Spring interview questions. Some Spring MVC questions are tricky like Struts and Spring integration and can be only answered by experienced Java program with 2 to 4-year experience in Spring MVC framework. How to implement Role-based access control in Spring? P.S. - If you want to learn Spring 5 and Spring Boot 2 from scratch, in a guided, code-focused way the I also suggest you check out Eugen Paraschiv's Learn Spring: The Master Class. He has recently launched this course after 2.5 years, which is full of exercises and examples to further cement the real world concepts you will learn from the course. Explain Spring MVC flow with a simple example e.g. starting from Container receives request and forward to your Java application ? What is difference in Spring MVC and Spring core? Can you use Spring MVC framework along with Struts ? I have an existing Java MVC application which is based in Struts, Can I migrate that to use Spring MVC ? How ? What is advantage of Spring MVC framework over Struts 1.0 or Struts 2.0 ? is it worth to convert an existing Struts application to Spring MVC ? How does Spring resolves view returned by ModelAndView class ? Some Spring MVC questions are tricky e.g. Struts and Spring integration and can be only answered by experienced Java program with 2 to 4 year experience in Spring MVC framework. 1)IF User checked in CheckBox and got validation error on otherfields and than he unchecked the CheckBox, what would be selection status in command object in Spring MVC ? How do you fix this issue ? Since during HTTP post, if checkbox is unchecked than HTTP does include a request parameter for checkbox, which means updated selection won't be picked up. you can use hidden form field, starting with _ to fix this in Spring MVC. quite tricky question to answer if you are not aware of HTTP POST behavior and Spring MVC. 2) What are different implementation of View interface you have used in Spring MVC ? 3) How to escape HTML special characters using Spring MVC ? there are some methods in Spring tag library, can't remember now. Nice answer bhaumik, Can't remember now! Please explain what is difference between spring mvc and struts 2.0? Does anyone know the answers to the other questions? Please explain Spring MVC Controllers what are the different Cotrollers available and how to use it.and how those better then struts Action classes. These qustions are quite good to test candidates with 1 to 3 year of experience. You can ask these questions on phone interviews as well, I have added in my own list. I particularly like the diffrence between singlton and request scope difference and whether spring beans are thread-sfae or not. Hi Paul, amazing questions and answers. Regarding questions 22 there is many more classes in Spring that implement that interface. I popular example would be the TilesView class. Be careful if you use the latter because there are two: org.springframework.web.servlet.view.tiles3.TilesView and org.springframework.web.servlet.view.tiles2.TilesView and the behaviour is slightly changes. Even though Spring is not part of core java I increasingly see questions from Spring in core Java interviews. thanks for sharing these, hope you could share some more questions related to performance and security aspect of Spring framework. I recently had a Java interview, I've been asked among the rest, about @Qualifier and @Autowired annotation.